prevent the summer brain drain Archives - AlphaBEST Education, Inc.
It’s that time of the year again: summer is approaching, students are anxiously awaiting its arrival and parents are searching for a safe environment for their children to learn and have fun during the summer break. Our SummerZone summer enrichment program is designed to engage students in exciting learning experiences as well as prevent the summer “brain drain“. 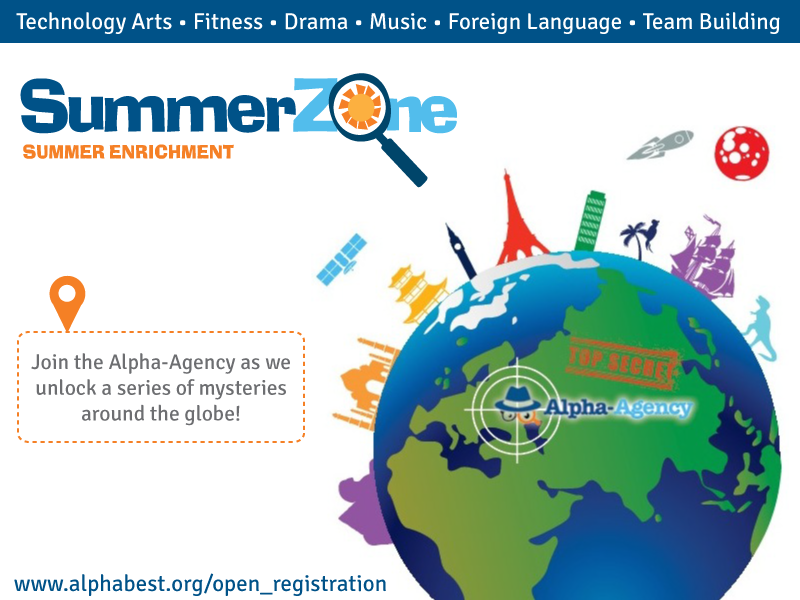 Each summer, we select a special theme for students to explore, and this summer they are joining the Alpha-Agency! Students will experience fitness, technology arts, drama, music, foreign language and team building as they unlock a series of mysteries around the globe. Do you think your child will enjoy being a detective for the summer? View our SummerZone locations and registration dates. We promise your child an action-packed summer vacation!